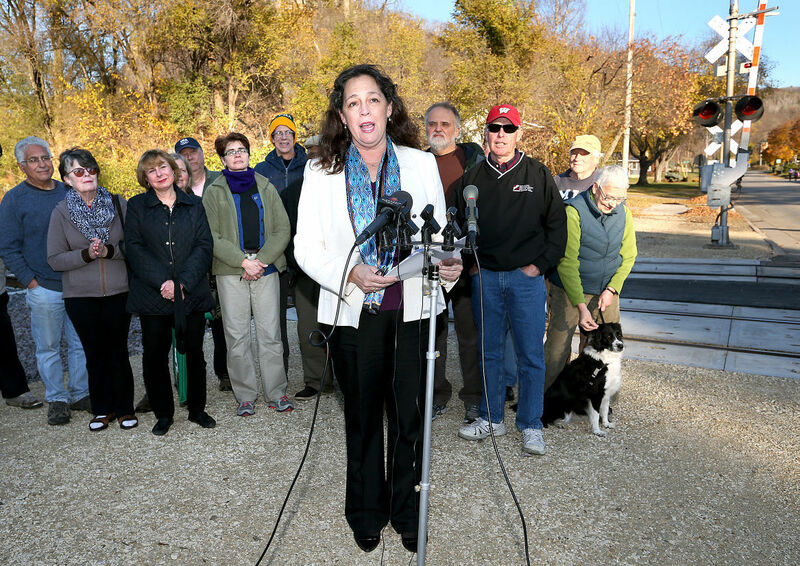 Backed by members of Citizens Acting for Rail Safety, Rep. Jill Billings, D-La Crosse, speaks Tuesday during a press conference at the Cass Street rail crossing at which she announced a bill she is sponsoring that would fund more state rail inspectors and training for first responders. Cleanup crews work to remove derailed cars from the Mississippi River on Monday after Saturday’s train derailment in Alma, Wis. The derailment dumped an estimated 18,500 gallons of ethanol into the river. Wisconsin lawmakers have introduced new rail safety legislation after a weekend during which two trains derailed about 200 miles apart in the state, spilling oil and chemicals. 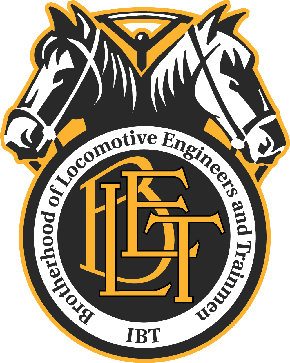 Rep. Jill Billings, D-La Crosse, announced Tuesday that she is circulating a bill that would fund more state rail inspectors and training for first responders while requiring railroads to submit emergency prevention and response plans detailing how they would handle incidents like the derailment of a BNSF freight train Saturday morning that spilled up to 20,000 gallons of ethanol in Mississippi River backwaters near Alma. “Derailments are becoming all too common,” Billings said while standing with about two dozen local rail safety advocates in front of BNSF tracks that were recently upgraded through the city of La Crosse to eliminate a bottleneck in the railroad’s network. A Canadian Pacific train carrying crude oil left the tracks Sunday in Watertown, Wis., spilling hundreds of gallons and prompting an evacuation in the southern Wisconsin city. The law would also establish response timelines for such disasters. Billings said a companion bill sponsored by Sens. Jennifer Shilling, D-La Crosse, Robert Wirch, D-Kenosha, and Jerry Petroski, R-Marathon, is being circulated in the upper chamber. Billings said the legislation is modeled after a Minnesota law enacted last year. Rail traffic resumed Tuesday morning on the BNSF tracks through western Wisconsin as crews continued cleanup in Reick’s Lake north of Alma, where about 25 cars, including tankers and empty auto transporters, left the tracks Saturday. The Environmental Protection Agency is leading the cleanup effort and monitoring the environmental impacts. Sabrina Chandler, manager of the Upper Mississippi River National Wildlife and Fish Refuge, said she had not received any mortality reports as of Tuesday and water samples had yet to show alcohol levels above the threshold where prolonged exposure is harmful to aquatic life. Chandler said conditions could change with heavy rains forecast for today. BNSF operates 20 to 30 trains per week carrying at least 1 million gallons of volatile crude oil from North Dakota along those tracks that run parallel to the Mississippi River from south of the Twin Cities to the Illinois border, according to information provided to state emergency officials and released in response to Tribune open records requests. The train in Saturday’s derailment was not carrying crude oil, according to BNSF documents provided to the EPA. Twenty of the 112 cars were carrying hazardous materials, according to the manifest: 15 were loaded with ethanol while five had sodium hydroxide residue. U.S. Rep. Ron Kind, D-Wis., wrote to House leaders Monday urging them to vote on rail safety legislation that would prohibit the use of older DOT-111 tank cars, which were involved in the Alma derailment. La Crosse County Supervisor Maureen Freedland, a member of Citizens Acting for Rail Safety, praised the new legislation. Freedland is the lead plaintiff in a court case challenging the state Department of Natural Resources’ approval of BNSF’s plans to add the second track through the La Crosse River marsh. That case is expected to be decided later this year, although trains began running on the new track this fall.